The island first came to be referenced in chronicles in 421 AD, when people from Padua and Este fled there to escape the barbaric invasions. In the 9th century the island started to be intensely populated, and in the following centuries its importance grew steadily, until it was governed by a dedicated Podestà. In 1379 Venice came under attack from the Genoan fleet; the people of Poveglia were moved to the Giudecca, and the Venetian government built on the island a permanent fortification, called "the Octagon," still visible today. The island remained uninhabited in the following centuries; in 1527 the doge offered the island to the Camaldolese monks, but they refused the offer. Poveglia was constructed on a permanent fortification built by the Venetian government, and from 1793-1814 was used as a plague quarantine station, or "lazaretto" - one of many in the Venetian lagoon. The tiny island is said to have hosted over 160,000 infected souls living out their final days and hours there - so many that there are whispers that 50% of the soil consists of human remains. 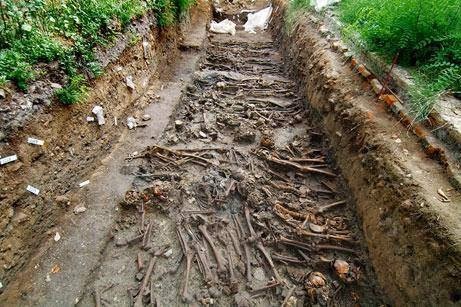 Recently, mass graves have been found on the nearby islands of Lazaretto Nuovo and Lazzaretto Vecchio containing the remains of thousands of plague victims. Poveglia has yet to be fully investigated. Finding the location of Poveglia to be small and easily missed, Napoleon also used the island for a darker purpose, and stored weapons there. The location was discovered, and many small battles took place as the island claimed even more lives. In 1922, a mental hospital was opened on Poveglia. Local legend says that one doctor at the hospital tortured and killed many of his patients, butchering them horribly only to later die by falling from, or possibly being thrown off of, its bell tower. The hospital closed in 1968, and the ruins are still there, slowly being reclaimed by greenery. And while it is professed to be a former retirement home, evidence that it housed mental patients is still evident. 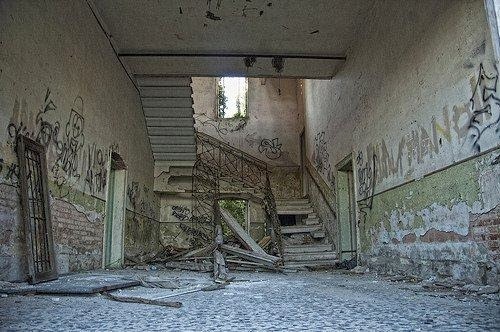 With a past like this, it's not surprising that Poveglia is believed to be haunted, attracting the attention of ghost hunters and paranormal investigators. Elsewhere in the lagoon, the remains of the Insane Asylum on San Servolo Island are preserved as a museum dedicated to the history of Venice's plague islands and asylums. Poveglia remains for now strictly off-limits to visitors.